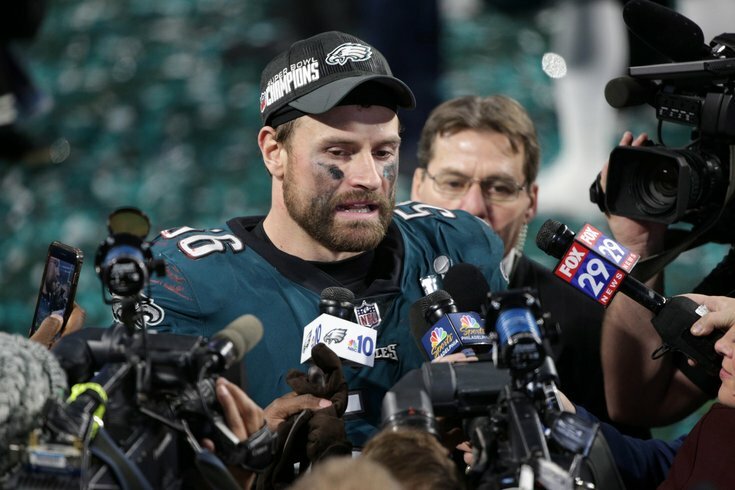 Philadelphia Eagles defensive end Chris Long is interviewed after defeating the New England Patriots in Super Bowl LII. One of the spoils of victory in professional sports is the honor of being invited to visit the White House by the sitting president. Since 1924, when the Washington Senators were honored by President Calvin Coolidge, it's more or less been an unwritten tradition and expectation in modern day American sports. But there was no social media in 1924. There was also no Donald Trump. The controversial current Commander in Chief revoked the Golden State Warriors' invite — or the Warriors refused to attend (depending on who you ask) — to 1600 Pennsylvania Avenue back in February. Issues of race and social injustice made several of the NBA champions uncomfortable visiting the White House. For the 2018 Super Bowl champion Eagles, there are similarly some players uncomfortable. Leading up to the June 5 scheduled visit to D.C., players like Malcolm Jenkins and former Eagle Torrey Smith have made it clear they will not attend. But several other Eagles are still struggling with the decision. "I am still deciding," Zach Ertz said after OTAs began Tuesday. "I think the one thing, this isn't going to be a divisive moment in the locker room. It's not going to cause a rift. My wife had gone in the past after they won the World Cup and she talked about how great it was to see the history. Whether you agree with the administration in there or not, it is the premiere building in our country where every important decision has been made." Because of the political climate we are in, it will be taken as a political statement either way, whether you want it to be or not. Players dream of this honor — and for many it's a shame that politics has been dragged into it. For some, it's not a political statement. "I don't personally view it as a political thing whatsoever," Carson Wentz said. "I don't really mess with politics very often but I will be involved in going. "My take is, I am going to do whatever the team does after they vote," Lane Johnson said, "I am not a really political guy." Neither is fellow lineman Brandon Brooks, but he can't help but feel like going to the White House is endorsing — in some way — the man who lives there. “Because of the political climate we are in, it will be taken as a political statement either way, whether you want it to be or not," he said. The Eagles seamlessly created a strong, character-driven locker room culture last season, allowing players like Jenkins, Rodney McLeod, Chris Long and others speak out for social issues while non-political or conservative players felt supported and respected too. Perhaps a model for our country in a microcosm, the much-written-about White House visit will not be any kind of chasm for the team as it prepares its Super Bowl defense. "They're awesome here about giving guys a choice," Chris Long said. "Nobody is judging anybody — it’s an honor to get invited to the White House."